One of the highlights of each week involves crawling out of bed on Saturday morning, getting washed and dressed, avoiding breakfast, and heading on over to the local Jenny Craig outlet, there to visit with some of the city’s most beautiful women. Getting weighed in is an added bonus. This has been a routine for about five years now, I think. In a previous incarnation (read: before five years ago), I was over 300 pounds. I don’t know by how much, on account of I stopped checking once I hit the 300 mark. I don’t think I ever managed to attain Beast level, which is 350 pounds. I probably got pretty close though. It’s a funny thing – when you’re not self-aware, you can miss so much. Like the fact that I was not only fat, but my life was in danger. I didn’t know I was fat. I know that just as sure as I know that the last sentence doesn’t make any kind of logical sense. In my mind’s eye, I was still the teenage boy who couldn’t get over 128 pounds. Ever. I remember looking in the mirror back then, breathing in, and being able to count my ribs. I suppose semi-starvation will do that to you. One day some nasty evil family member took a side photo of me, sitting at the dining room table with my family. That wasn’t nice of them at all. And then, to add insult to horror, they showed it to me. And that’s when I knew I was fat. I wasn’t overweight, stout, big-boned or obese. I was friggin’ FAT. In looking around, I saw other friends who had become overweight. I saw them start various starvation diets, and fad diets, lose weight and gain it all back again. Then, when I was doing improvisational comedy, I met this beautiful blue-eyed blonde girl. She saw my shyness and something clicked for her, so she made it a point to draw me into her crowd and we became friends. I only learned about six months later that she had once been overweight too, and had gone to Jenny Craig. When we met up for the first time, she had been out of the Jenny Craig program for two years, and had – obviously – kept the weight off. That was good enough for me. I joined. I lost. And lost, and am still losing. Yes, it’s been five years, and I’ve gained a little back now and then but for the most part, the slide has been a very very slow slide downward. They say that’s the best way to lose. If you lose it gradually (just as you gained it gradually) you have a better chance of keeping it off. I agree. My Jenny Craig counselor is a gorgeous laughing brunette named Maria. Every week she weighs me in, and then we sit down and talk about the previous week. “What’s the plastic bag for?” she asked me. “Um, well that’s something to have so that I can empty my pockets before getting weighed in.” I then proceeded to put in my wallet, keys, change, iPhone, ebook reader, and everything else you can think of into it. “Oh” she said, thinking. “So that’s kind of like your purse, huh?” Her blue eyes were twinkling, even though she kept a straight face. One of the things we talk about is technology. She is severely behind the times when it comes to the latest gadget, even though she thinks the iPhone is pretty neat. I have counseled her about it, advising her when to buy, and what to get in terms of a data plan. We talked some more and then she weighed me in. I had lost another pound. When I lose weight, Maria likes to put a sticky on my record. After doing the customary male pride rejection of that idea – and after she persisted anyway – I gave in (really, I didn’t have a chance – her and her idea were just both too cute). Every time I lose weight now, she drags out that sticker book and announces that I’m getting another one. It makes me smile every time. And you wonder why I like Saturdays so much. Okay now that’s a Nice story, hmmphhhahhhemmm. Sorry just clearing my throat there, it had nothing to do with how touching it was, I swear…. *grinning* Glad you enjoyed it. This is one of those blogs that kept me smiling even as I wrote it. This blog reminds me of some of the best of our conversations. I was happy to see it here and also slightly blown away. The wolf is showing his tummy just a wee little bit and I like it. :0) I hope you’ll understand what I mean by that. I understand the struggle. To beat something like that and KEEP beating it is an incredible accomplishment. You made me grin. I adore you, my friend. You know what I mean. 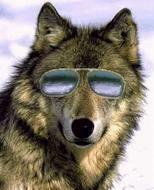 *grins* I see behind “Wolfshades” – at least a bit – and it’s nice to see more of you in him. I felt that way when you wrote the piece about your mom just before you left ms. I’ll have to do some catch up reading to see the tone of what you’re writing these days. There is a daughter-in-law of a friend who is a Jenny Craig employee. She keeps both her husband and father in law on the Plan. They have decided one improvement would be to add Jenny Craig Beer. Not as good as Labatts, but hey. I’m curious: how are the husband and father doing? This is great. Something new about you. You continue to remind me of Shrek–layers like an onion coming off one at a time. Except you aren’t as smelly as an onion. I admire your tenacity and determination to continue with this plan over so much time. I think you have it exactly right. It’s the long view that is best. People want everything to happen NOW! I did too, when I was about seventeen. Over the years, you figure out that it really doesn’t matter what the timeline is, as long as you are moving forward towards the goal. This can be applied to so many things. Patience, determination…good virtues. I appreciate that, Abe. I still want pretty much everything right now, and need to be reminded once in a while that the wait is worth it. I’m pretty sure the advertising has a lot to do with it. Companies market their products – internet services, easy credit terms on furniture, you name it – on the notion that you can have whatever you want right now. Actually that’s the next hurdle: undoing the years of damage done by adopting some of those “easy term” credit offerings. Progess is not always immediate. Sometimes we wait…. And then wait again. ……. I am SO far from a patient person, but I’m learning it. *head smack the woman now* I don’t know, as I’ve never been more than 20-30 (pounds). over-weight, and most likely I am now, but when I’m under-weight, people freakout. It’s not weight, it’s the issues, Doug. Food to me is the enemy. To you it’s the savior. Funny. Or Prozac for everyone? I never did get that one down. Like you, I get really impatient sometimes. Sometimes for good reason too. I once again enjoyed your posting. Great job on today’s results! I wouldn’t get the iPod Touch v. just getting iPhone either….I used to be one of those, “oh I don’t need an iPhone…my simple flip phone works just fine….” and now I”m sleeping with my iPhone…ha! You see? YOU SEE? Once you get one – bam – you’re an instant convert. You’re helpless in the hands of the Apple corporation. :) Bet you’re enjoying it, huh? Darn right I am, ha! But, the convenience of the e-mail and internet right in palm of my hand is pretty cool. That was the main sell….the games and all that were just a bonus. The whole configuration works for me, but primarily having email, a phone (with an easy to populate contact list), plus a huge music storage area was the attraction for me. The internet – not so much because the phone is so small yet. I’m way behind. I still have TWO tin cans and a string. Ha! Not even an iPod touch, huh? This was sweet and an eye-opener on who you are…kinda cool, actually. Hope you enjoyed your Saturday again yesterday! Keep on keepin’ on. . . I really did enjoy Saturday and now can’t wait to get out to the gym today. So glad you stopped by, Nadia. :) Happy Sunday to you! Here’s two stickers. One for you and one for Maria! But what ever happened to the Blonde you followed to Jenny Craig’s? Don’t tell me you not only lost weight, but also the love of your life. The blonde and I are good friends but that’s it. And she was married at the time too, so there was no chance of romance. She has since divorced and has moved out of town and is following her dream as an actress. *shrug* Whaddya going to do? This was a great read. I thoroughly enjoyed it, and you made me smile throughout the entire thing. I worked for Jenny Craig for one day. I liked it. Unfortunately the timing with childcare, divorce, school, life and such was just all wrong. I was really looking forward to working there and forming bonds with the clinetele. Thanks Monica! Maria and I really do have a great rapport. Consequently, even on those weeks where I blow it, I still look forward to going in to get weighed – just to see what the damage is. I forget how long I’ve been with the program now but I’ve never ever gone back to that huge guy I once was.